Have I mentioned how deep I am into Halloween this season?! 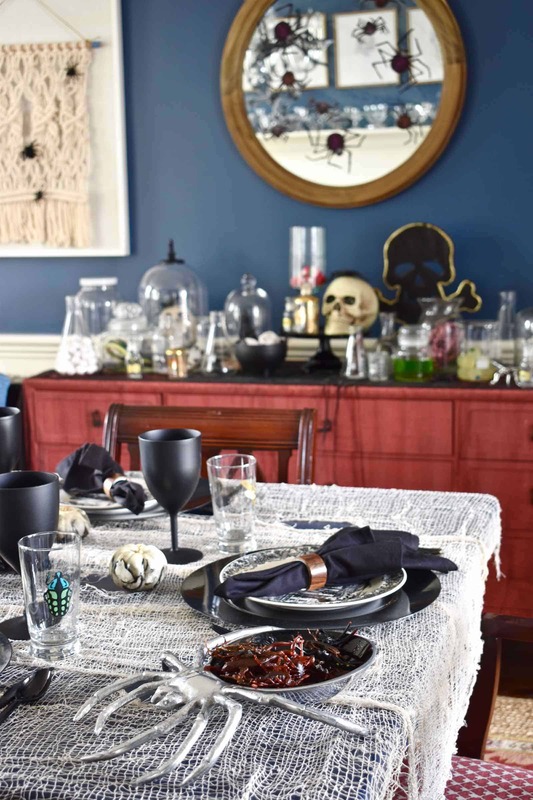 I’ve *never* decorated for Halloween before, but this year I had the opportunity to have a magazine photograph our decorations for 2018, so I HAD to go in whole hog. 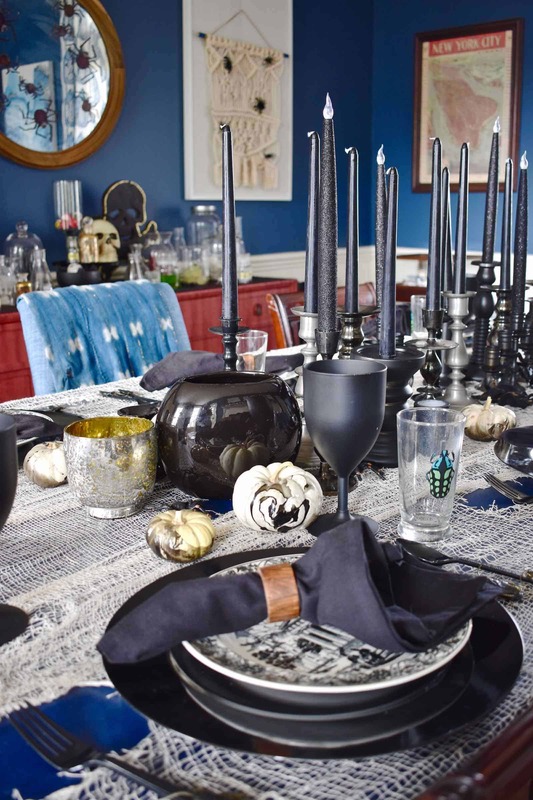 The magazine was kind enough to let me post some of the pictures, so I’m going to share our tablescape here today and then later in the week, I’ll give you a quick peek at some of the other vignettes I have set up. There are some finishing touches that will come out just for the magazine, but this should give you the general idea! 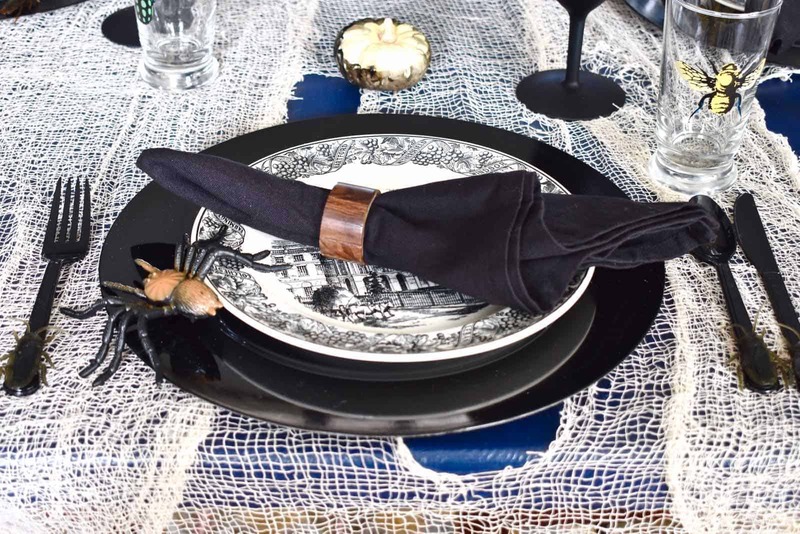 Our table is navy blue, so I started by putting some off white ‘gauze’ on top so that the table setting would actually show up. 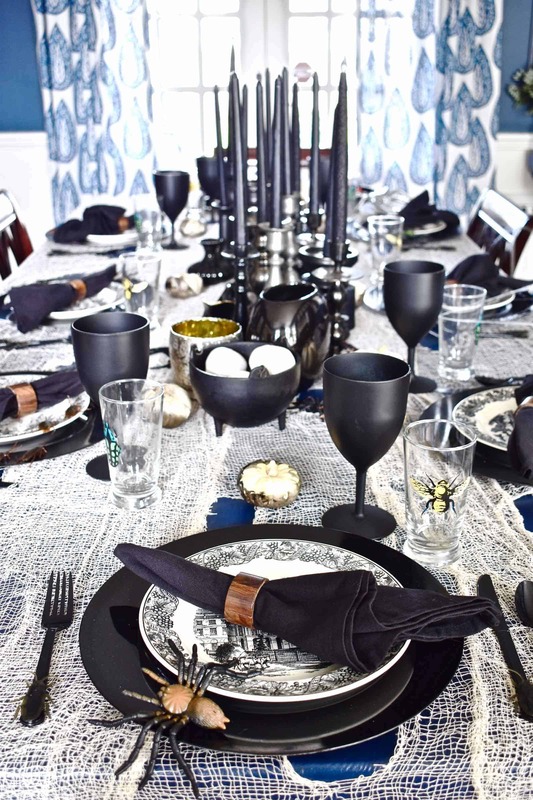 The centerpiece is a dozen or so candlesticks with black taper candles. 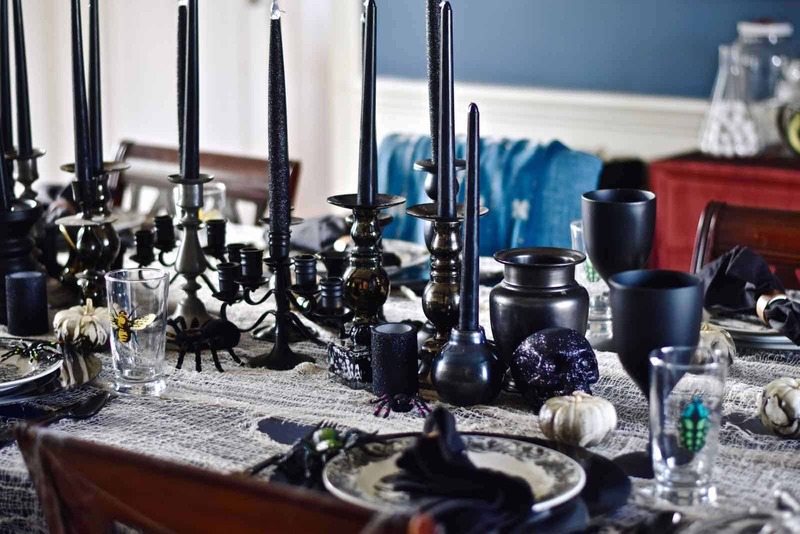 Some of the candlesticks came that way, and others I gave a coat of flat black spray paint to. I also peppered in a few little black containers, and my plan is to pop a little dry ice in those so that it has a smoky appearance for the photo shoot. 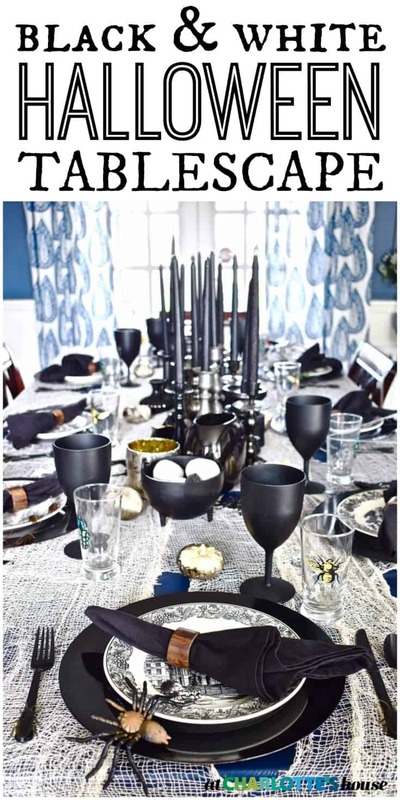 The goblets at each place setting were originally 25¢ a piece and bright blue plastic. A coat of flat black spray paint transformed those bad boys too. Are you sensing a theme… alllll the black spray paint. 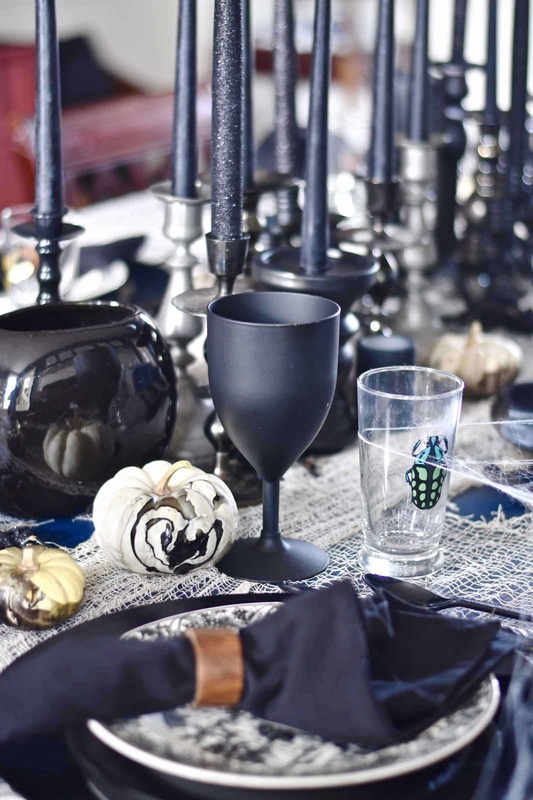 I already had the bug glasses from World Market (no longer available) and they were perfect for a Halloween table. The chargers are plastic and from Michaels. 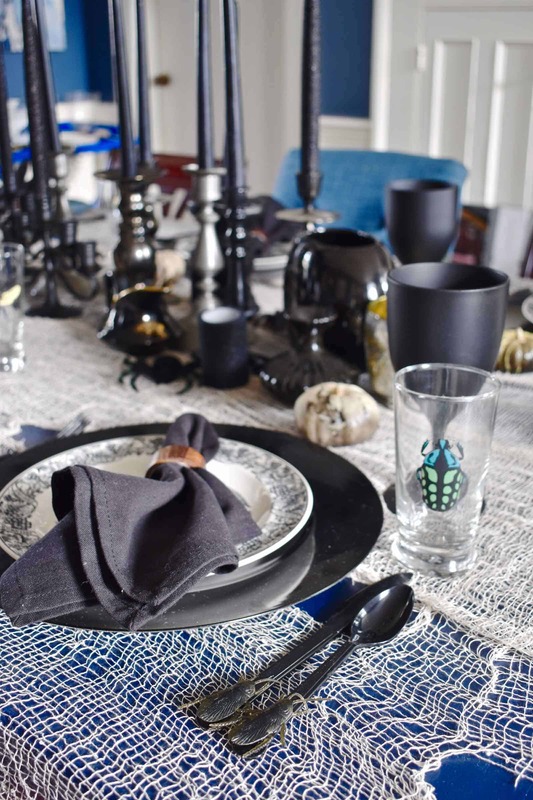 I’m not normally a fan of plastic, but I’m not normally a fan of black for a table setting either so… these were the right compromise. The black and white plates came home with me from the flea market and I love them. They’re actually Connecticut locations so these plates will get used a bunch on non-Halloween days. 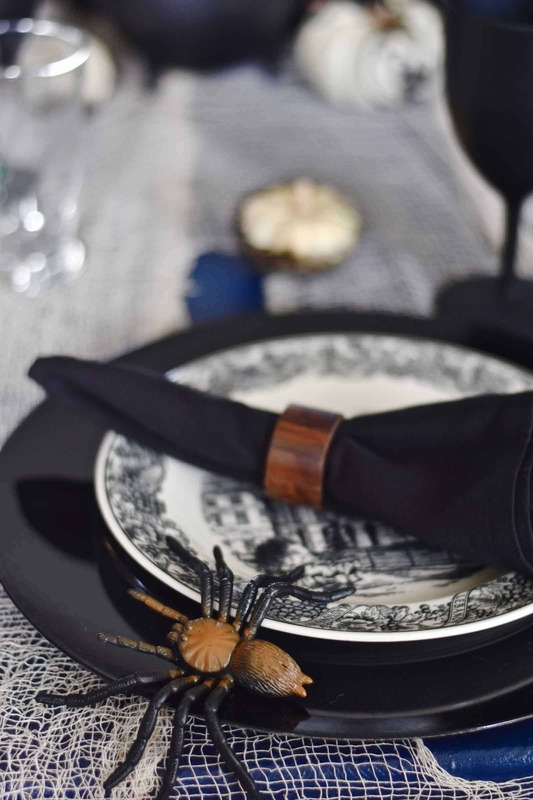 Eleanor felt strongly that we needed black napkins so I miraculously found those at Homegoods. 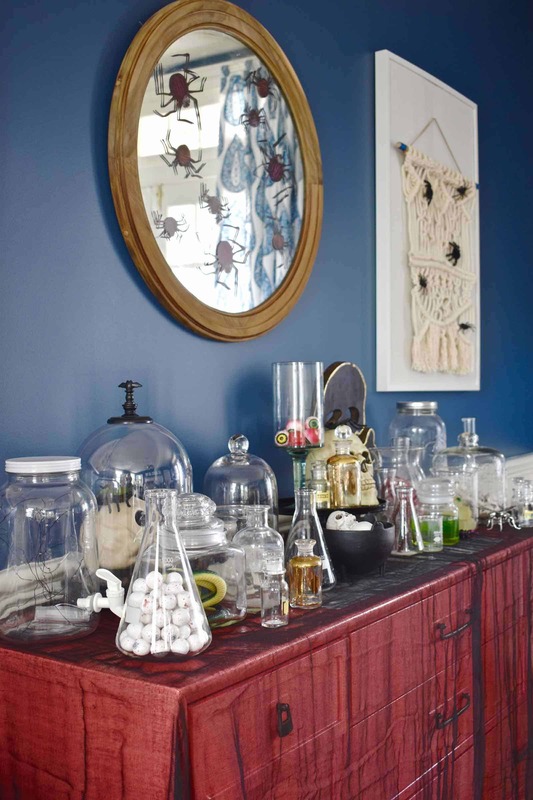 Do you notice the sideboard? That’s my chemistry lab… It’s essentially a series of thrift store glass and beakers from Michaels that I’m filling with rubber animals, rubber eyeballs and various liquids like green dish soap. I’m also hoping to throw some dry ice in this set up too! I’ve also printed out some creepy labels that I’ll add to the beakers to give it a hint of authenticity. 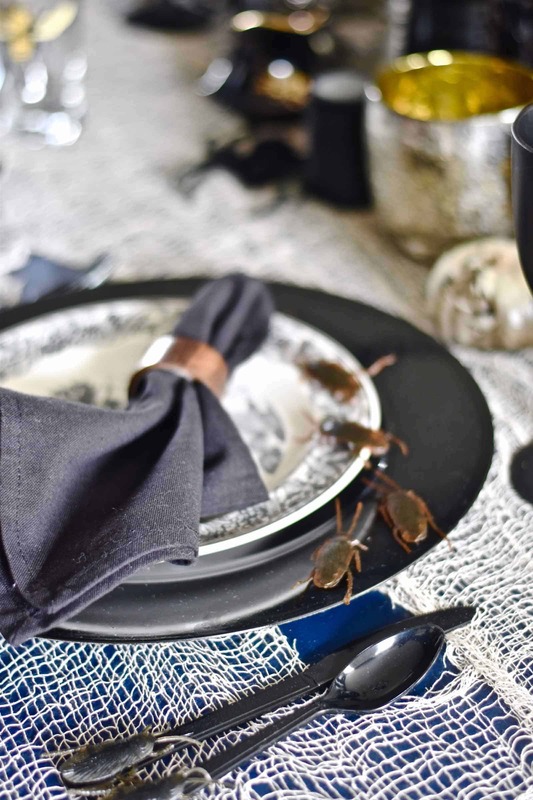 Did you notice the black plastic cutlery that I glued plastic cockroaches onto? A favorite detail! 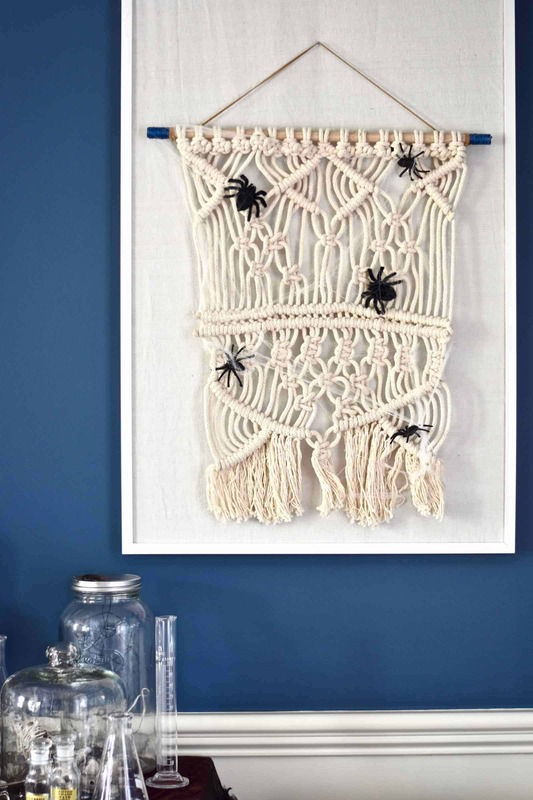 I’m still fine tuning my cobweb game and plan to scatter about eleventy-jillion more creepy crawlies onto the table, but for now… this is where we’re at! Tune in later in the week for the rest of the decor. Did I mention I’m obsessed? I’m a full-in Halloween type of a gal now. No telling what I’ll come up with next year! 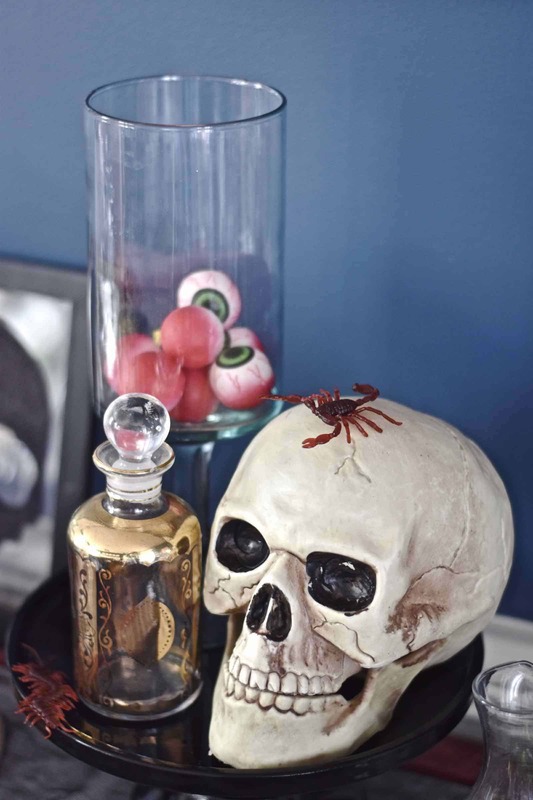 Here’s my question… where do YOU stand with Halloween decor: WAY in, or totally out? Oooooh, spooky! 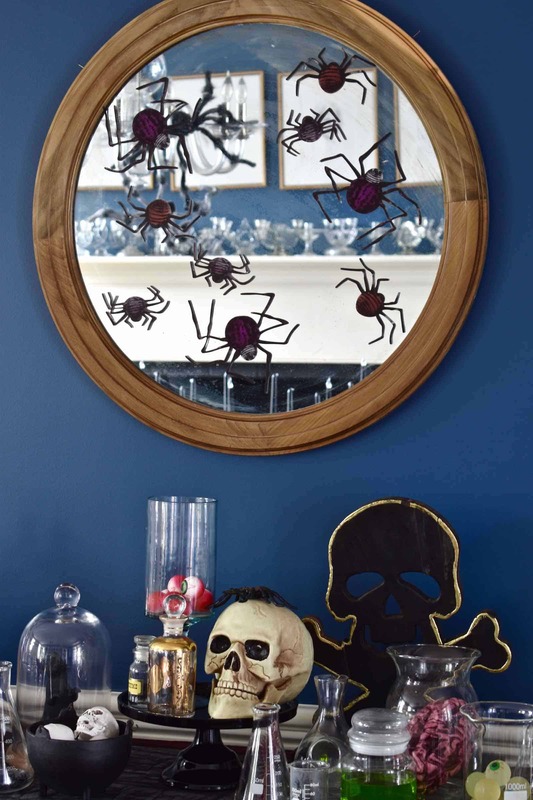 I bet your kids are pumped for halloween! 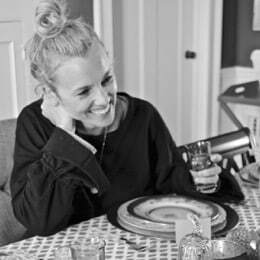 It has been a joy to watch you decorate and gather for this holiday!!! Yay! Love hearing about other people’s decorations!